another week, another adventure or another dull routine... August have been very hectic to say it softly. I really want to thank Courtney and Ivy for keeping things running in my absence, I didn't expected it to be so long, and although I had the opportunity to sneak into the chat, blogging was an overkill for me. This week The FreakSpeakers blog celebrates its first anniversary. A year already! Many thought we wouldn't last this long, and sincerely after all the controversies I'm even surprised of our endurance. We have had great moments, some thunderstorms and hurricanes... but we are still standing and having fun in the process. For our chat regulars and lurkers, we changed the chatroom platform. It is a lot more friendly and it is supposed to work better... follow the link and check it out! (remember @10 PM) With this platform we have a lot more control. Anderson Cooper, just wanna warn ya: The boys in Manhattan’s David Barton gym are on a mission, I’ve been informed, to sidle up to you at the urinals every time you go for a little relief, in case you hadn’t noticed, which, I’m certain, is an impossibility. Take it as a compliment, you little CNN cutie! Last time I heard there was such a package-peeking explosion in New Yawk, it was aimed at the hunk who may rest in peace, JFK Jr. So, take the compliment already, babe. And to enhance your morning, and as usual, here some photos of Anderson! I'm off to get some coffee! Congratulations on one year! I just "found" this site a few months ago. Glad I did. 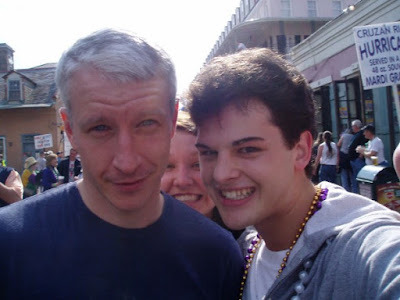 Do you think Anderson is going to be in New Orleans for the 2nd anniversay of Katrina, since he was a big part of it? He has not been on for the last two days. As for the gym story, I am sure that he is savvy enough to keep his privates private LOL It's a shame, though, that he would have to be so guarded all the time. This would be funny if it weren't for the fact that it's probably true. There are some real sickos out there! Can you imagine having to look over your shoulder every time you visit the loo? He might find a gym with a higher percentage of females and straight men a bit less intrusive. Some people have no concept of privacy--and they really, really, REALLY need to get a life. I haven't watched 360 in ages but I will watch this week for the New Orleans coverage. I'm glad he's keeping it a priority. 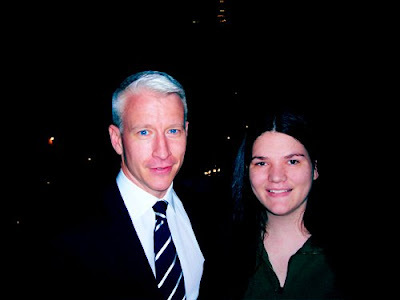 I like Anderson - AS A JOURNALIST! I don't really care to see his "package". I don't watch 360 often, just when there is breaking news or specials like PIP and NOLA coverage. The caption to the second picture should be "Get me the EFFFF outta here"
You're kidding, right? A gym full of straight females would eat him alive. Congrats Chris on the 1 year anniversary for the blog. Tried to do the chat but no one was there. I'm the same, can't figure out how to get into the chat room. Way too confusing. Maybe you can post a cheat sheet for us "simple folk" on how to access it?? Conratulations on your lst Anniversary! the new chat platform is horrible. most folks cannot get in or figure out how to use it. what was the reason for the switch? maybe you post some instructions so people know how to get in, ortherwise i don't think anyone will use the chatroom anymore. Where in New York City would you find a gym like that? We'll test in this eve, thanks Chris! the anderson cooper quicktopic board has a sighting of Charlie Moore shopping at the Time Warner Center on Monday (in NYC). I personally believe Anderson is on vacation. Statistically speaking, there are more straight men & women working out at Manhattan gyms than there are gay men working out at random Manhattan gyms. No matter how aggressive straight females might be around Anderson, females are not free to use the mens locker room. Anderson could pee at the gym in peace. I wouldn't think Anderson would be on vacation as he has his 2 year anniversaty Katrina special tonite. Probably preparing it. Well, that is certainly disgusting. He's not a celebrity icon though he's treated as one. Last time I checked, he's a reporter, a journalist, and an anchor at CNN! These sick puppies really should leave him alone. Thanks for keeping on keeping on holding on to NOLA by a thread. PLEASE don't let go!